The territory now occupied by the Republic of Uruguay was discovered in 1516 by the leader of a Spanish exploration party, named Juan Diaz de Solia. Uruguay in South America is boarded in the north and north eastern frontiers by Brazil and separated from Argentina by the Rio de la Plata river in the south and the Rio Uruguay in the west, the east is boarded by the Atlantic Ocean. Uruguay covers 176,215 square kilometres, there are no impenetrable forests or deserts regions or mountains the highest point is Cerro Catradel altitude 513 meters. The climate is similar to Australia. Over 80% of the population lives in towns mainly on the Atlantic coast with 44-5% living in the capital Montevideo. About 17% of the population live in rural areas despite the fact the economy depends to a large extent on agriculture. The country side is ideal for livestock and cropping enterprises with many rivers criss-crossing the country. Property sizes are much smaller than in Australia with owners making a living from small holdings. From Australia flying time to the capital Montevideo is about seventeen hours via New Zealand and Chile. 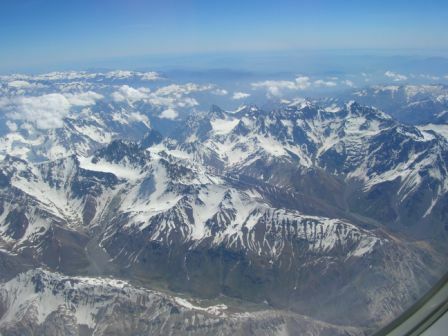 A highlight of the journey is the flight over the Andres Mountains, which were snow covered, and they are as spectacular as the Rocky Mountains in Canada. I was asked by Ariel Martinez Director of Red Apicola to conduct a training course for Commercial beekeepers accompanied by my wife in December. Ariel was an excellent host, along with the coordinator Miss Carolina Ricca and translator Mr Enrique Neme Ortiz. The course was attended by 42 beekeepers and honey packers over 3 long days. In 2000 I conducted two training courses and it was very pleasing to revisit, see the progress being made and meet those beekeepers I had previously met and some new ones. The current Uruguay Minister for Agriculture Mr Andres Berterreche had attended one of the 2000 courses. Much to the delight of the beekeepers attending the 2009 course at La Paz,130km from Montevideo, he spoke one afternoon to the beekeepers attending. It was very pleasing to see a Minister for Agriculture so interested in the welfare of the beekeeping industry. The bees are Apis mellifera mellifera and Apis mellifera lugustica, they appear to be much more aggressive than the stock used in Australia and in some parts of Uruguay bordering Brazil, Africanised stock are present and slowly spreading. I visited this area in 2000 but not on this trip. The larger beekeeping enterprises run many more colonies than Australian beekeepers; one I visited owned by Fernando Roth operates 9000 colonies. Apiary sizes are much smaller than in Australia due to the smaller farms and more aggressive bees. Interest is being shown in the Italian race – excellent queen rearing methods are being used, with Cloake starter/finisher hives and six-way ideal queen-mating nucs. All hives are of the Langstroth standard. There is some interest in importing breeder Queens from Australia. Plantation planting spaces vary if trees are spaced - 3x2 that gives 600 trees to the hectare, 3x3 gives 1,300 trees to the hectare, 4x3gives 1,000 trees to the hectare. 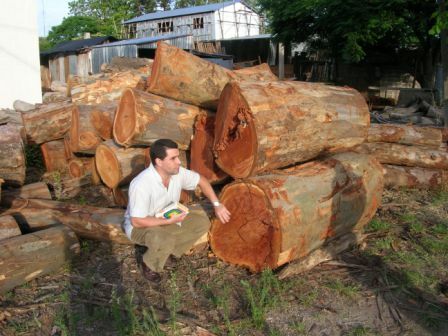 Timber companies are experimenting with hybrid eucalyptus for future plantation use. Many farmers have planted eucalyptus as shelter and shade trees, as well as the government along roadways. In some areas the country side is very similar to Australia, many of the species that have been planted are not the species listed above, these all help supply nectar and pollen for the bees. Harvest time depends on the use and this restricts the plantation’s benefits for honey production. Beekeepers working the plantations for honey production find, as occurs here with eucalyptus forests in Australia, the production varies greatly between the eucalyptus. In the case of Flooded Gum E. grandis yields can vary from 0-100 kgs per hive. E. globulus globulus 0-40kgs per hive from older plantations close to the sea. This tree is often harvested after seven years regrowth from the root stock, harvested again after seven years and another regrowth from the original root stock in another seven years. Tree density in plantation is very much higher than occurs in a natural forest in Australia and this results in very little understory plants - these are often very valuable in giving colonies an alternate source of pollen and nectar when the eucalyptus flowers in forests. Extracting plants are of a high quality, honey packers buy the honey and it also appears as through beekeepers join groups that also bulk-buy honey from the group as well as market honey and other products. One group had recently purchased 2000 pollen traps as a management tool for collecting pollen when pollen was plentiful. Ground flora and Eucalypt honey are the main honeys produced. Significant strengthening of the Euro gives European packers and importers a significant price advantage in purchasing Uruguayan honey at the present time. Uruguay exports up to 95% of its honey production, mainly into Europe. Colony Collapse Disorder has not been reported in Uruguay even though it has been associated closely with Varroa by many researchers. Varroa is a significant problem because the mites build up resistance to the treatments being used. Four different chemical controls are being used along with four organic controls, with strict controls in place concerning use. Nosema ceranae is present in Uruguay and when the disease gained a lot of publicity recently they were able to check samples 18 years old that showed N.ceranae. So it had been present in Apis mellifera for many years before being detected in that part of the world. The beekeepers of Uruguay were very interested in beekeeping in Australia and are keen to meet as many as possible before or after Apimondia in Argentina in 2011, as Colonia das Sacramento is only a 30 minute ferry trip across the widest river in the world to Buenos Aires. We visited Colonia, it is an exciting tourist town, with English menus and entertaining waiters with wonderful hats. If you like coffee it is the place to be, we drank litres of it with boiled milk. La Red Apicola appreciated the training I provided and is looking forward to me returning in the future. Beekeepers would benefit by visiting Uruguay by learning how they manage such large beekeeping businesses, even though the apiary sizes are small. The Uruguayan’s are wonderfully hospitable people and not in a hurry but the evening meal can start about 9pm up till midnight, so expect long nights. They are like beekeepers all over the world and love to talk long into the night, on our last night we went to bed at midnight and they were still going at 4am but were bright-eyed and bushy-tailed the next morning for the lectures.